Turn study time into game time by entering Virtual Reality! 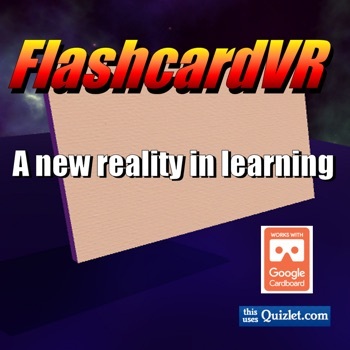 FlashcardVR for Google Cardboard takes you from the reality of sitting at a desk, flipping mind numbing flashcards and transports you into a fascinating electronic world where learning is a side effect of the experience. There are two modes of interaction: "Flashcards" deals cards to you in groups of five at a time, and allows you to study new material for the first time. "Game" mode sends you off into space, where your job is to defend the planet from alien intruders by matching weapon cards to the appropriate intruder's term. "Miss" your shot and both cards are placed back in the deck for another round. FlashcardVR can read cards in multiple languages, including French, Spanish, German, and English. Hearing foreign vocabulary words as well as seeing them is a huge boon for foreign language students. Flashcard information comes from Quizlet.com, one of the worlds largest collections of flashcard data. You can select from millions of pre-existing flashcard sets, or create your own custom sets. Quizlet integration requires full activation via an In App Purchase. 3D Virtual Reality requires intensive graphics processing. Users of older iPhones such as the 5 series may sometimes experience a short lag in visual updates when in VR mode. It is recommended you avoid quick head movements as this lag can cause some sensitive people to experience motion sickness. It is recommended you download the app and try the demo mode before you activate the full Quizlet integration if you are concerned about this possibility.